경기도 안성의 고려시대 절터인 봉업사지 출토로 전해지는 대형의 이 향로는 몸체[노신(爐身)]와 덮개[개부(蓋部)], 그리고 기대(器臺) 부분에 삼족(三足)의 받침을 지닌 특수한 형태이다. 몸체 구연부의 넓은 전을 지닌 고려시대 향완보다 좀더 앞선 시기에 만들어진 형태로 추정된다. 향로의 중간 부분은 고려시대의 향완과 비슷한 형태를 보여주며 보주(寶珠)가 달린 뚜껑이나 세발이 달린 원형의 대좌는 전체적으로 균형 잡힌 비례감과 장중하고 아름다운 형태를 구성한다. 덮개부의 불꽃형상 보주는 사리기에 나타나는 정교한 화염보주(火焰寶珠) 형태로서 도금의 흔적이 남아 있다. 덮개부에는 ‘봉업사삼중대사원준(奉業寺三重大師元준)’이란 점열로 새긴 명문이 있는데 이는 봉업사의 원준대사가 직접 만들었다기보다는 원준의 발원으로 조성된 것이며, 받침부분의 ‘중념육근(중卄六斤)’의 명문은 향로주조에 구리 26근이 소요되었음을 알 수 있다. 명문에 의해 고려 초의 사찰이었던 봉업사에서 제작한 고려 전기의 향로로서 조형미가 매우 뛰어난 걸작이다. 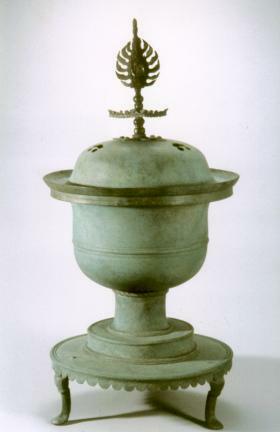 This large incense burner was discovered at the former site of Bongeopsa Temple, which existed during the Goryeo Dynasty, in Anseong, Gyeonggi-do. It consists of the nosin (body) and gaebu (lid), and a pedestal with three legs to support the body. 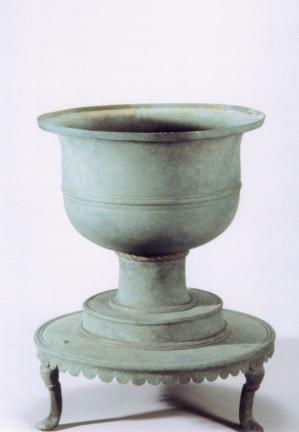 It is unique in that there is no broad projecting rim, a characteristic feature of most incense burners of the Goryeo Dynasty. However, the body of the incense burner closely resembles the shape of hyangwan (bowl-shaped incense burners) of the Goryeo Dynasty. The boju (finial) on top of the lid and the round pedestal with three legs add overall balance and proportion to the structure, as well as a dignified beauty. 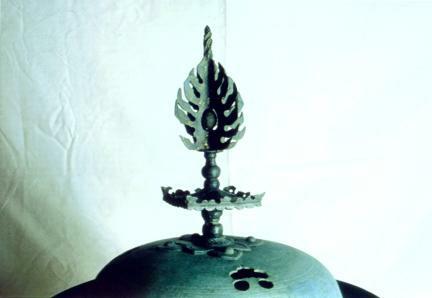 The lid is decorated with an elaborate boju, which appears to have been gilded. It is in the shape of a stylized flame, much like the ones found in sarira reliquaries. 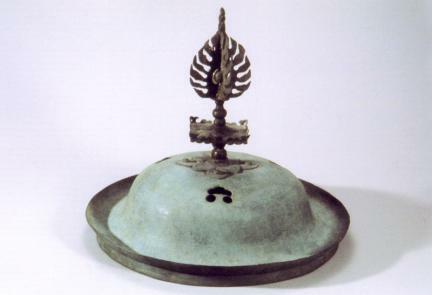 The words “Buddhist Monk Wonjun, Bongeopsa Temple” are inscribed on the lid, suggesting that production of the Incense Burner was commissioned by Monk Wonjun of Bongeopsa Temple, rather than Wonjun having produced it by himself. Another inscription on the pedestal indicates that 15.6 kg of copper went into the casting of the incense burner. According to the inscriptions, it is assumed that the incense burner was produced in the 13th century at Bongeopsa Temple, which existed during the early Goryeo Dynasty.